So you are in a hurry and want to grab a quick bite. What’s your best bet calorie for dollar? Men’s Health magazine does such a great job of explaining which fast food meal selections are better for you with their “Eat This Not That “column. They now made it into a book. 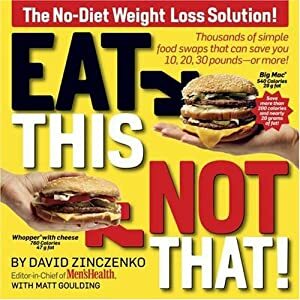 A sample of the trade off between a few extra cents or bucks and the increase to your fat and calorie consumption from the Men’s Health article, “4 Must-Know Restaurant Secret’s,” By David Zinczenko, with Matt Goulding – here. 7-Eleven: Gulp to Double Gulp Coca-Cola Classic: 37 cents extra buys 450 more calories. Cinnabon: Minibon to Classic Cinnabon: 48 more cents buys 370 more calories. Movie theater: Small to medium unbuttered popcorn: 71 additional cents buys you 500 more calories. Convenience store: Regular to “The Big One” Snickers: 33 more cents packs on 230 more calories. McDonald’s: Quarter Pounder with Cheese to Medium Quarter Pounder with Cheese Extra Value Meal: An additional $1.41 gets you 660 more calories. Subway: 6-inch to 12-inch Tuna Sub: $1.53 more buys 420 more calories. Wendy’s: Classic Double with Cheese to Classic Double with Cheese Old Fashioned Combo Meal: $1.57 extra buys you 600 more calories. Baskin Robbins: Chocolate Chip Ice Cream, Kids’ Scoop, to Double Scoop: For another $1.62, you’ve added 390 calories. Want the Eat This, Not That info but don’t want to carry around a book. 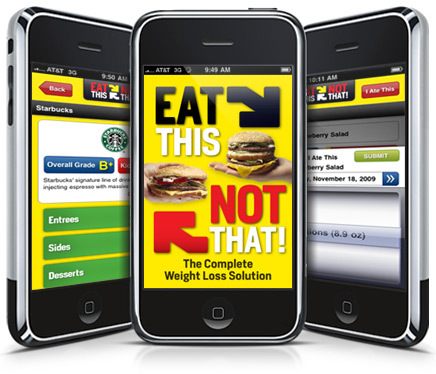 Men’s Health has a solution for you: the new Eat This, Not That iphone app. Check it out here.